Categories > 6BR, 6BR Improved & Wildcats > Interesting Dasher Info! 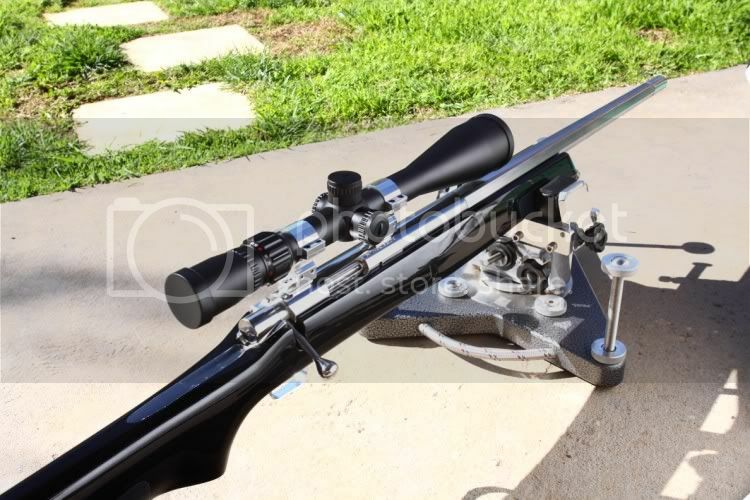 I recently shot a new rifle chambered in Dasher in a 500m comp. The rifle performed very well. At the time I did not have much time to get it up and running, and really just threw a load together. Actually decided on load in the practice the day prior to the shoot. I have had two previous Dashers. Both shot very well. Both with 107SMK, one went to 32.8grains RE-15, the other 32.6 grains RE-15. No moly and into the lands. These were not chronied. So, today I put the load over the chrony for the new rifle. Do not even think about trying these loads in your rifle! Rifle BAT 3L, Lilja 1:8 3 groove 28" long. RE-15 at 34.5grains, 20thou into lands, CCI450, 103 Spencer moly. CED M2 chrony, 11ft from muzzle. 3005fps, SD 11.5, ES 33. The numbers from the chrony are not not to great, but the rifle shot very well on target at 500m at the previous comp, and first one for the rifle. The problem I had with this rifle was that the load required a lot greater amount of powder, and on doing a quick ladder test to find pressure I was amazed at what I got too, and how the shots looked on the target at 500m. Even though there was 1 full grain of powder difference, the shots still hit the plate with around 2" windage, and around 2.5" vertical at 500m. This is with near 100fps difference. I also really cant believe how much powder I am getting in this rifle. So the question is.... how much difference does SD and ES make. smaller the better, and this load of 34.5 is not much good, but it does shoot. I have another 500m comp this weekend coming, so nows the next question... I'm at 3005fps... should I step it up into the 3020-3070fps area.. this is where they seem to shoot well? Maybe back it off a little to that slower area that seems to shoot well? This rifle is different to my other rifles by a long shot. The amount of powder needed to get the velocity is crazy. 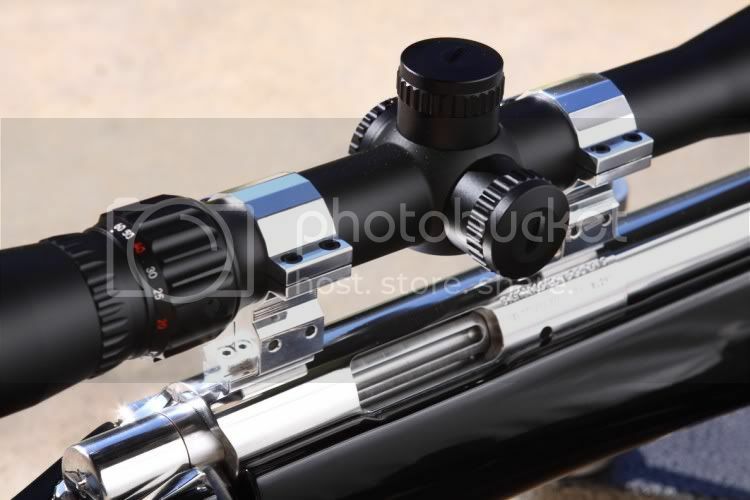 Here is a pict of the rifle. I'll pass on some thoughts on my lastest barrel. 28 1/2" .236 Krieger, Bat, McMillan, Nightforce. This is at least the fourth barrel that Varget wins over R-15. I run nothing but moly, and pushed R-15 to 35 grains with 105 VLD's at a touch over 3100 with this one, but the accuracy still comes with Varget. My last two barrels shoot the same load, 34.5 grains with the moly plated 105's hard into the lands at around 3050. This is in a .269 neck and 104 FB. With 33 fps spread, I'd do a little more work. Maybe try a little more neck tension. I run around between 3 1/2 - 4 thou. Was there not a plateau in your ladder test? I also shot this 34.5 grains load at 1000yds. It did very well also in some very tricky conditions. Strong switchy winds. The second group caught me out, but the vertical in the two groups was very very good. I just wonder what the ES of 33fps does on target? The only thing I can think of which could have brought the 33fps spread into this load used previously, was that the loaded rounds were what was left after the comp. They had been sitting for 3 weeks???? Maybe the ES is a lot less when they havn't been sitting???? With the ladder test I did at 500m, I was looking for pressure and velocity. Saying that, over the full grain of powder in the test the groups was only 2" wind, 2.5" elevation. This was a very good group with near 100fps difference. I really couldnt see any plateau with a group like this. My neck is 0.272", and the freebore 0.125", which I find very good! I am very happy with where the projectile sits within the case. I am using a 0.267" bushing, so around 2.5 thou tension. I might try a little more. I will not have enough time to test before this weekend coming, so I think I will up the load to 34.9 grains RE-15 (do not try this in your rifle) to get to that 3050fps area, and also increase the neck tension to 3.5 thou.